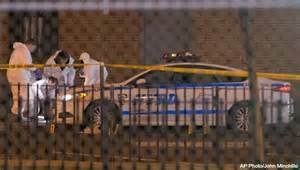 Two of New York City’s finest were murdered execution style as they sat in their patrol car in the Bedford Stuyvesant section of Brooklyn. Bed Sty as it’s referred to in Brooklyn, was at one time, one of the most dangerous neighborhoods in the Borough. However, as is the case with many other Brooklyn neighborhoods, it has become safer and gentrified over the past several years. The suspect, Ismaaiyl Brinsley, shot his girlfriend in Baltimore before heading north to New York City where he executed the two police officers. Following the murders of Police Officers Rafael Ramos and Wenjian Liu, Brinsley headed down into the subway where he shot and killed himself. Brinslety was obviously unstable but the media coverage of the protests in response to the Eric Garner and Michael Brown cases, surely played some role in his decision to come to New York and kill the officers. In addition, while no one can stop lunatics from committing horrific acts of violence, irresponsible leaders like Al Sharpton, and the Mayor did nothing to diffuse the tensions even after officers were attacked on the Brooklyn Bridge. Sharpton should have ZERO credibility after the Tawana Brawley fiasco (I have a long memory). He is a rabble-rouser and a joke and it’s absolutely incredible that anyone would take him seriously. The mayor is an even bigger joke except that he’s not funny. He should be held accountable for dividing the city and turning against the hard-working men and women of the NYPD. When he stood up at a press conference and discussed how his son was told to behave with the police, he basically said the police are the enemy and are to be feared. It’s a ludicrous thing for him to have said considering he’s the so-called Commander and Chief of law enforcement in the city. I don’t know how he can ever make this right because one could have predicted this would happen. He did nothing to ensure that he had 100% confidence in the police and now he is a pariah, as evidenced by the fact that police officers turned their backs as he entered Woodhull Medical Center. It’s a title he has clearly earned. On a personal note, I have had the distinct honor of training many police officers over the years and every single one, was exactly what you would expect of the men and women who risk their safety everyday to protect the citizens of this city. Some of the nicest, best people you could ever hope to be associated with. Heartfelt sorrow and condolences go out to the families of the slain officers. Let’s hope that no other acts of violence follow but that is far from a certainty.